This was the second “Low Cost House Series” project, sponsored by Korea Child Fund to improve a living environment for low-income families. The house was situated in a small rural village of Jangheung town in southeastern province of Korean peninsula and was a home for a family of parents and five children. It was a very old and shabby building tilted to a side and stood right next to an unused cow house filled with the remains of cow waste attracting all sorts of flies and bugs. The surroundings were filthy, and the smell was appalling. However, the worst part of the house was ‘rats’, which literally occupied the whole building. It was the family who had to avoid the rats and find their own spaces. The rats were unafraid of men, and their exact numbers were never to be known. As such, an open outside toilet without walls was the least problem to the family. To them, this horrible living situation was somewhat regarded as something they had to live by. After examining the whole house, we decided to knock it down and rebuild it. It was clearly not in a condition to be renovated, and above all, it seemed like the only way to escape from the rats. However, the first problem we encountered was a tight budget. Compared to our first low-cost house project in Beolkyo, the number of family as well as the required space were larger this time. Although the budget for both projects was similar, this was a new construction work unlike the Beolkyo’s renovation one. The huge budget issue naturally led us to find ideas to save the costs while creating a larger space. A room to cut costs was finally found in building materials. 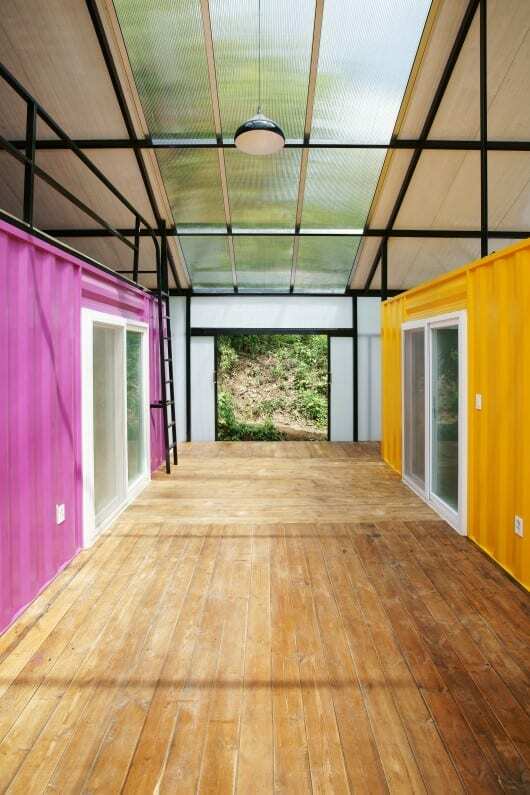 What we chose was ‘container houses’ which could minimize both field works and construction time. But their poor insulation and floor noise, vertically in particular, created other problems we had to tackle. As our building was to be built as a single floor, the only concerns remained were to improve insulation and create enough space for the family of seven even with three containers of merely 50.4 m2. April 10, 2019 - House in Ferndale built from repurposed shipping containers WDIV ClickOnDetroitA new home on Inman Street in Ferndale stands out from the rest of the neighborhood. April 18, 2019 - The Container Store's Top 10 Most Popular Items - What to Buy at the Container Store HouseBeautiful.comThese are the most popular items that the Container Store always keeps in stock. March 29, 2019 - What You Need to Know About Shipping Container Homes Zing! Blog by Quicken LoansIf you're interested in constructing a shipping container home, here are some financial and logistical considerations. April 19, 2019 - How to organize your spices so that you’ll actually use them before they fade The Washington PostTo cut down on messes and waste, find the method that works for you. April 19, 2019 - California Man Sets Himself on Fire in Target Parking Lot The Epoch TimesA California man set himself on fire in the parking lot of a Target store, suffering third-degree burns to half his body. April 19, 2019 - Celebrate Earth Day in Bushwick bushwickdaily.comBushwick is hosting a Earth Day festival, park meditations, and neighborhood clean-ups! — Bushwick Daily. April 17, 2019 - Centralizing Container and Kubernetes Management Container JournalA modern enterprise using container technology and Kubernetes has multiple software development infrastructure requirements. April 2, 2019 - Joburg’s R4,900 per month container home development is up for auction BusinessTechDrivelines Studios, made from upcycled ISO shipping containers, is now up for auction. April 2, 2019 - Housing project made of shipping containers to break ground in central Tucson Arizona Daily StarStackhouse will have about 44 units on Stone Avenue, just south of Speedway. April 19, 2019 - A Desert Festival Not Named Coachella The New York TimesFriday: Exploring the scene at Bombay Beach; California and the Mueller report; and La Copine. April 17, 2019 - The Black-Thumbed Guide to a Beautiful Garden From the Pros Who Know Realtor.com NewsIt's easy to go wild at the garden store. But making sure your purchases survive? That's a different story. Follow these expert tips to keep things growing. April 19, 2019 - School granted permission for containers to deal with 'storage issues' Bradford Telegraph and ArgusA SCHOOL with "storage issues" has been given permission to install two storage containers on its grounds. March 20, 2019 - $450K shipping container home in Ferndale may be the new trend Detroit Free PressSeveral homes made of shipping containers have been built or are under construction in older suburban areas, including Ferndale and Royal Oak. January 14, 2019 - Delridge Resident Makes House in a Shipping Container SeattlemagIn this age of escalating construction costs, a young Delridge resident looks to shipping containers when designing her starter home. April 19, 2019 - Holes in walls, dead cockroach-type insects found: Lancaster County restaurant inspections, April 19, 2019 LancasterOnlineThe Pennsylvania, Department of Agriculture, 866-366-3723, uses a risk-based inspection reporting process for restaurants and other food handlers. March 11, 2019 - Shipping container home hits Tampa Heights ABC Action NewsA new, unique housing trend is popping up in Tampa's oldest suburb. April 18, 2019 - Let the Kids Lead Your Next Adventure OutsideThe author shares her experience of letting go (for the most part) and allowing her son to lead the way on adventures. January 15, 2019 - Letter: $600,000? For a container house? The Mercury NewsSan Jose City Council members who OK'd these housing units for the homeless near Willow Glen must be insane. February 18, 2019 - Shipping Container Living ForbesContainer houses can be both beautiful and efficient. Here are two beautiful examples with some info about the containers themselves. January 2, 2019 - Shipping container home has a sweet roof terrace CurbedThis short-term rental in Waco, Texas, is a perfect Venn diagram of design trends: a shipping container and tiny home wrapped into a single petite package. November 1, 2018 - Shipping container house rich in glass and greenery CurbedSometimes a shipping container house looks like a house made from shipping containers. Other times, it looks like this gorgeous home in Dhaka, Bangladesh. February 16, 2019 - Shipping Containers House the Homeless of Bristol The Maritime ExecutiveBy MarEx 2019-02-16 18:19:18. Old shipping containers are being turned into living spaces in the U.K. as part of a project by the charity Help Bristol's Homeless. February 19, 2019 - St. Augustine artist builds shipping container home after Hurricane Irma ActionNewsJax.comA local artist who lost his home in Hurricane Irma is making sure he's protected against future hurricanes. December 24, 2018 - Container house for lava evacuees remains in Honolulu Hawaii News NowA company in China that offered to help those displaced by the recent eruption of Kilauea volcano has sent its first prefabricated container home to the state. September 26, 2018 - Sleek shipping container house asks $875K CurbedArchitect Adam Kalkin designed this 4000-square-foot home with an array of upcycled industrial materials. December 1, 2018 - OMG I Want This House: New Jersey's Shipping Container House (Photos) The Daily BeastThe Daily Beast presents a look at one of the most insane houses in the world. March 14, 2019 - A Shipping Container Home In Ferndale Lists For $450,000 Plus The Measles Are Back Daily DetroitThere's a new house in a modest neighborhood of northeast Ferndale, made of shipping containers, that is listing for $450,000. Photo via Realtor.com. November 16, 2018 - True Studio is a 162 sq. ft. modern shipping container home TreehuggerThis cozy and compact dwelling out of Oregon packs one bed, one bathroom, a kitchen and porch. March 9, 2019 - 'Life Box' container house sold at auction, raising money for cancer charity Stuff.co.nzA cancer charity will be the winner after the Life Box container house sold for $117500. September 28, 2018 - A shipping container home is going up near Crown Candy STLtoday.comTravis and Gina Sheridan are having a shipping container home built on Thursday, Sept. 27, 2018 down the street from Crown Candy in Old North St. Louis. November 5, 2018 - Five Badass Homes for $15,000 and Up for People Who Refuse to Pay Mortgages FreeHome prices are at a record high. Instead of giving up on ever owning a house or committing to a monster mortgage, consider these alternative housing options. October 1, 2018 - McLeod Bovell's Container House perches on a West Vancouver hillside DezeenCanadian firm McLeod Bovell has created a two-storey dwelling for a sloped site with sea views, with a rear volume that cantilevers over a swimming pool. September 12, 2018 - Konbuild shipping container homes break out of the box TreehuggerThis kind of shipping container housing makes sense. October 15, 2018 - This tiny shipping container home adapts to your needs InhabitatImagine a home that grows with you. Now, see your dream come to life in this unique tiny home built from a recycled shipping container that adjusts to your life. November 13, 2018 - Denver firefighter uses 9 shipping containers to build a family home InhabitatRetired firefighter Regan Foster converted nine repurposed shipping containers into a massive home. Take a look at how he did it, and tour this stunning home. November 5, 2018 - New affordable, sustainable container homes arrive in Tampa Bay WFLAThe hottest trend in real estate is a 40-feet metal box, and you can find them in Tampa Bay. May 29, 2018 - Shipping container hotel in Texas lets you try out tiny living CurbedOn the heels of companies starting to offer sleek, customizable shipping container homes for purchase, a new trend has emerged: the shipping container hotel. November 5, 2018 - Portland developer builds homes from shipping containers KGW.comCarl Coffman and his company Relevant Buildings are upcycling shipping containers into homes and multi-story condo complexes. January 8, 2019 - An Uptown shipping container home is for sale for $290,000. Curbed NOLAA heated cocktail pool, wide pine floors, and translucent walls are just a few of its nifty touches. August 7, 2018 - Remember that St. Charles home of shipping containers? It's on Netflix's 'Amazing Interiors' St. Louis Post-DispatchThe home of Zack and Brie Smithey in St. Charles is built from shipping containers, photographed Wednesday, March 1, 2017. Photo by Sid Hastings. October 26, 2018 - Innovative Shipping Container Home by Renowned Architect Listed in Califon Jersey DigsDesigned by architect Adam Kalkin, an industry leader in pre-fab architecture, this home uses shipping containers to create a strikingly modern design. November 27, 2018 - Moundsville family is building a tiny house apartment complex with storage containers WTRFMOUNDSVILLE, W.Va. (WTRF) - If and when the ethane cracker comes to the Ohio Valley, there will be a huge influx of workers needing a place to live. September 19, 2018 - Modern Shipping Container Marvel in New Jersey on the Market for $875K Realtor.com NewsShipping container living has never looked so sparkling. This modern structure in New Jersey offers the ideal blend of modern life and rural setting. October 12, 2018 - Keepin' It Local: Couple excited to move into metal container home in Boise KTVB.comJo Burgoon and Evan Lynam are very excited to move into their new home made of huge metal shipping containers.